A climber had to be airlifted off Snowdon after he was hit by an avalanche as snow brought disruption for a second day across Wales. 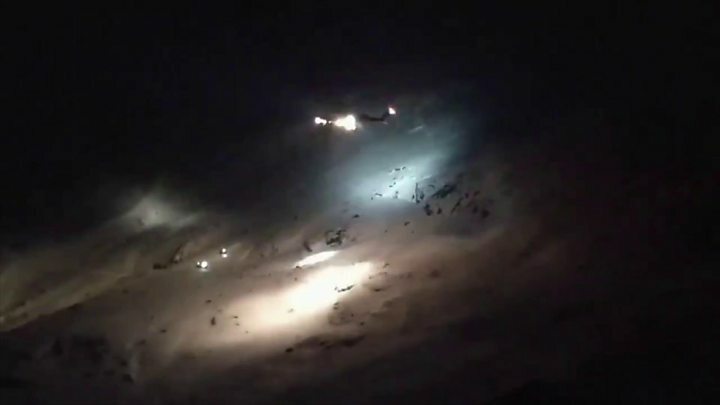 The man broke his leg and had to be helped off the mountain by Llanberis Mountain Rescue Team, the RAF and the coastguard on Tuesday evening. Meanwhile, dozens of schools and some roads were closed, with some crashes reported on Wednesday. 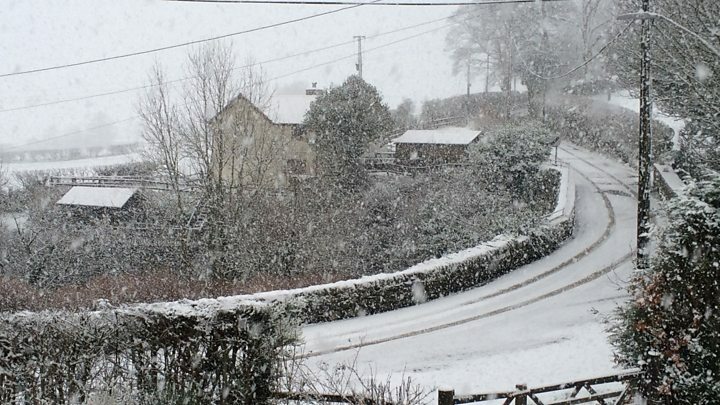 A Met Office yellow warning for snow and ice has been extended until Friday. Media captionHow is Wales faring in the wintry weather? John Grisdale, a volunteer with the mountain rescue team, said the man and two friends were climbing on the Trinity Face when they were hit by an avalanche. He said the fact one of them had suffered only minor injuries was "very lucky" due to dangerous levels of fresh snow on steep faces. Mr Grisdale explained that avalanches were common in north Wales during periods of heavy snow and high wind, due to accumulations of snow becoming unstable. "Take good account of the weather - even experienced mountaineers can get in trouble if they are out when conditions are so unstable," Mr Grisdale said. More than 100 schools remained closed in Flintshire, Conwy, Denbighshire, Gwynedd, Carmarthenshire, Wrexham and Powys on Wednesday. Traffic data firm Inrix warned of "hazardous driving conditions" due to ice on the A470 between Penderyn and Hirwaun in Rhondda Cynon Taff on Wednesday evening. And Traffic Wales said conditions were "poor" along sections of the A55 near Bangor, Gwynedd. The Met Office said temperatures could plummet to -9C on Wednesday night, with a chance of freezing, patchy fog. Thursday could see increasing winds alongside outbreaks of some snow in the afternoon, while Friday will have more sleet and snow before a dry afternoon. A yellow warning for snow and ice is in place between 13:00 GMT Thursday and 21:00 on Friday. Police said they received reports of crashes on the A55 in Flintshire on Wednesday. And Gwent Police said that a car had overturned in Rhymney in Caerphilly county, but there had been "no major injuries". 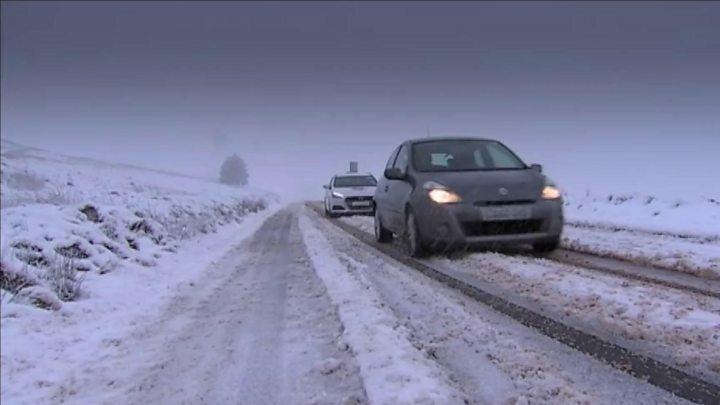 Driving conditions on the A55 between junctions 27 for St Asaph and 33 for Northop were particularly bad due to snow, North Wales Police said. And there were long delays on the A55 westbound at junction 35, Dobbs Hill, Flintshire, due to a crash. In Carmarthenshire, Rehoboth Road near Trimsaran closed in both directions between the B4308 Trimsaran Road to the B4309 Five Roads due to ice. BBC Wales reporter Mari Grug posted a video of her car being towed by a tractor in the deep snow in Uwch-y-Garreg, near Forge in Machynlleth. She wrote alongside the post: "The only way for some of us to get to work today." On Tuesday, snow ploughs were dispatched to the A44 near Aberystwyth and cars became trapped on the road. Schools across north Wales were also forced to close.